﻿ Information Security Threats Likely Happening in Your Office - Augusta Data Storage, Inc. Managing information security is an on-going process that requires education and understanding from each member of your organization, from upper management all the way down to your part-time employees, and even interns. From managing personal records via the computer to maintaining paper files, understanding the risks and working every day to prevent accidental breaches is key to a successful information security process. While there are many aspects of your business that require your attention every day, it’s important to remember that information security or the lack of security, can have a lasting impact on your business. There are many small steps you can take each day to make sure that you are keeping security top-of-mind. A security breach doesn’t have to involve a malicious hacking attempt or a complex phishing scam. 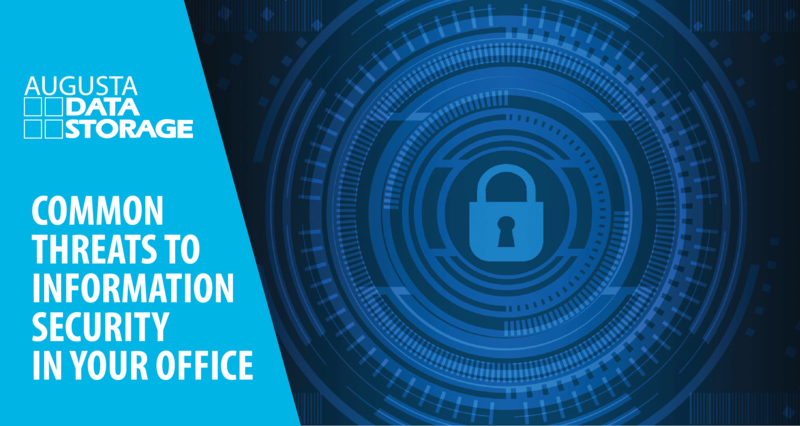 We’re outlining some of the most common information security threats that can be found in offices every day. In today’s ultra-digital business landscape, there seem to be an infinite number of devices that you can use to host, check, search, and store information. It’s important to make sure that any devices that might use or store proprietary or personally identifying information have a layer of security, such as passwords, pin numbers, or encryption to help protect the information. It seems strange to say that your old devices can pose a threat, but many offices have storage areas with stacks of old or outdated laptops that, in the wrong hands, could still allow someone access to secure information. Make sure that you are safely and securely destroying your outdated electronic devices. Staying up-to-date on the latest email phishing scams, viruses and hacking attempts will help ensure that your employees and staff are staying vigilant in monitoring the security of your digital information. Many offices have open file storage, either in organizers on desks or in unlocked drawers. While it allows for easier access during the work day, it also means the files are easier to access if left unattended. Make sure to take extra precautions to lock up paper files and records when you are away from your desk or out of the office. When you are done with your papers, it’s easy to just toss them into the recycling bin, but the same concept applies here as it did to unlocked drawers. If the items are not secure, it’s very easy for records to fall into the wrong hands. Make sure that your recycling containers or shred collection bins have locks on them. When you print documents or receive faxes on a common office printer or fax machine, it’s easy to get distracted on the way to the output tray, which means your papers are left unattended at the end of the machine. One of the easiest ways to resolve information security threats is to create an information security protocol that outlines what information should be kept secure and the appropriate steps to take to secure information. If you are not monitoring the implementation of your information security protocol and making it a priority, it will be easy for employees to brush it off as an afterthought. Make information security a priority and work to enforces guidelines to help protect your digital and hard-copy information. For many offices, extra storage space can be hard to come by. If a lack of storage means that you are not keeping your records secure, consider using a third-party record storage facility, like Augusta Data Storage. Having a destruction plan for your information, both paper and digital is important. If your business is just tossing records into the trash or stacking up old computers, tablets, and other devices into a storage closet, contact Augusta Data Storage to see how we can partner with you to develop a regular destruction schedule or assist with a one-time destruction purge of your records and outdated-digital devices.